Befriend a spaceship computer, to return to Earth. It turns out I wrote about Event way back in 2014, and in the intervening years I'd managed to forget, remember, forget then remember about this fascinating story-based game. An email just now reminds me of it again, and whadda ya know, it's one stating that Event is available right now. Andy's hands-on preview, and Shaun's news post will shed more light, but the short version is it's a game where you have to make friends with a lonely spaceship AI, for a chance to escape an otherwise abandoned space station and return to Earth. "You’ll freely navigate evocative 3D environments brought to life with physics-based rendering and advanced lighting techniques. You’ll examine items to gather information and solve hacking puzzles as you progress. You can even leave the ship for breathtakingly scary spacewalks! All sound and music come from the environment; there is no traditional score. The ship is essentially the AI computer’s body, and reacts to Kaizen’s feelings by making different sounds—pay attention for clues! "As in any relationship, there can be gratitude, disappointment, or jealousy, and Kaizen [the AI] reacts differently depending on its mood. 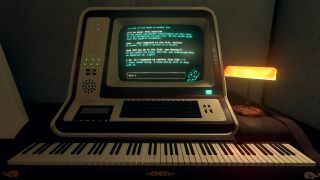 By working through the fears and anxieties of your virtual companion, you can eventually find your way back to Earth—while unraveling the cryptic history of the ship and the 1980s society from which it emerged." Event is available from Steam, from GOG, off of Humble, from Itch.io and from Games Republic, so pretty much everywhere. I've stashed the launch trailer somewhere above.